The Times Union of Albany recently published a story called “New York’s Property Tax Nightmare.” It was written by Bob Port and James M. Odato. Thank you Times Union. It is a great article about out of control property taxes. *This is required reading for all New Yorkers. I wrote an article in January of 2009 about property taxes in New York. It is still relevant and contains links to property tax information that you will find interesting or useful. You can read it here: Why are Property Taxes in New York so High? “Why not change the world?” is a Service Mark of Rensselaer Polytechnic Institute (RPI) in Troy, New York. I think it is a great slogan and they do good things there. In 2000 I bought a t-shirt at the RPI bookstore that had “Why Not Change the World?” printed on it. At the time, I was working in Troy providing computer tech support for Verizon. They had a central office on Fourth Street that was just down the hill from RPI. I visited their bookstore, saw the slogan on a t-shirt, liked the sound of it, and bought one. I wore it a lot and it became unwearable after several years. I went back to the bookstore to get another one at least five years ago and there were none available. I would still like to get another one, but they don’t sell them anymore. I’ve called and emailed the bookstore on several occasions over a couple of years, but the answer is always, “we just don’t sell them anymore” or something like that. They do sell a glass mug with the slogan, but I already have a favorite Barnes and Noble coffee cup with a picture of James Michener on it. You can’t buy them anymore either. Barnes and Noble stopped selling them years ago. I never see the cups anywhere else. You would think that one would show up on ebay or at a yard sale. I keep looking for one, but so far nothing. Am I the only person to buy and own a coffee cup with a picture of James Michener on it? Am I asking too much? Are there any RPI students or alumni out there that would like to have a “why not change the world?” t-shirt too? If enough people called or emailed the RPI bookstore perhaps they would change their mind and have a few t-shirts printed. You can find the phone number and email address on the RPI webpage. What do you think? Did you ever own a t-shirt from RPI with, “why not change the world?” on it? Thank you. Comments are appreciated. What a nightmare. I drove to work on I-87, the Adirondack Northway, last week. I got on at exit 14 in Saratoga Springs and got off at exit 6 near the Albany airport. 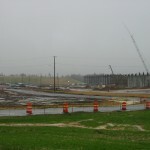 I was working at a company on British-American Boulevard off of Route 7 in Latham. I haven’t had to use the Northway to commute to work in quite a few years. In fact, the last time I used it to get to work was in 2000 when I lived near exit 8 and worked for Verizon at 158 State Street in Albany, across from the State Capitol. I was amazed at how many cars had only one person in them. In the five days that I drove on the Northway, I only saw one car with two people or more in it on the way to work. Doesn’t anybody carpool? With the price of gasoline so high and the Great Recession gripping the country for the past year, I didn’t expect to find traffic as usual on the Northway. Now, I didn’t look into every car going by. I was too busy keeping an eye on the car in front of me, but in the cars going by that I could see into safely, I only saw one car with more than one person. That just seems pretty ridiculous to me. I think I saw one bus too. I know that there must be more buses somewhere, but I only saw one. Maybe it was just the time I was commuting. I left my house around 6:55 am to be at work in Latham by 8:00 am. There has got to be a better way. I still can’t understand how the Northway comes to a complete halt around exits 9, 8A and 8. I know that there are a lot of cars entering the roadway at 9, 8A and 8, but they are entering the right hand lane. Why doesn’t the left lane and center lane keep moving? I’m assuming that since I am stopped and all the cars that I can see in front of me are stopped, that some car ahead of me that I can’t see and is “leading the pack” down the Northway, has come to a complete stop. Why? How can that be? There are no traffic lights, stop signs, yield signs, pedestrian crossings, or anything else to cause a car to come to a complete stop. It just doesn’t make sense. I would love to spend a morning in a helicopter and look down on “the mess.” Maybe then I could get a better understanding of what is happening. I have heard that the twin bridges crossing the Mohawk river present some sort of an optical illusion to some drivers. That could explain some of the slow down. I also know from experience that there is a hill after crossing the Mohawk and that most cars lose speed going up the hill because their drivers fail to accelerate to compensate. I have come to the conclusion that it is just incompetent drivers causing the problem. People who, among a lot of other things, won’t keep right and pass left. Some will just sit in the left hand lane, not passing anyone and clogging traffic. People who can’t be bothered to use a turn signal. People who still talk on their cell phones while driving. Here is a link to the website of the Car Talk guys that you have probably heard on the radio. Their website has a wealth of information about why you should not talk on the phone, hands-free or not, while you are driving a car. It’s incredibly dangerous. I was also surpised at how fast people were driving. The speed limit is 65. If you drive 65, even in the right hand lane, people are whizzing by you at 75, 80 or 85 miles an hour. What’s the rush? Seventy is a nice comfortable speed. Your chance of having an accident at 75 and 80 miles per hour is greater and the higher speed makes the results of the accident deadlier. Slow down and live. I thought by now, near the end of the first decade of the 21st century, that more employers would allow more employees to work from home. If people could work from home two days a week, that would cut down on traffic on the Northway by 40% on any given day. No more painfully slow, stressful commute. There would be less stress, less accidents and theoretically, cheaper insurance rates because you are driving your car fewer miles. You would spend a lot less money on gasoline and wear and tear on cars. Even if the price of gasoline is high, you won’t need to buy as much. I drive an old Honda Accord. My commute was 39 miles each way. I burned quite a bit of fuel to get back and forth. The job that I was doing was hands on. I was physically connecting and disconnecting equipment. It wasn’t something that I could do from home. Many people work on a computer when they get to work. With broadband cable or DSL, inexpensive computers and cheap phone calls, you should be able to do the same job working from home. Everybody wins. If you want, for $50 you can setup a camera on your computer so your boss can actually see and talk to you when it is necessary. If you are carpooling to work, I would love to hear how you got started. If you are working from home a few days a week instead of going into an office everyday, I would love to hear about how you got started doing that. If you are taking the bus, I’d like to hear about your experience too. Maybe your story can inspire someone else to carpool, work from home, or take the bus to work.. 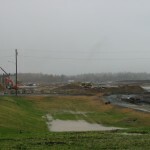 I went to the community open house at the Globalfoundries Fab2 construction site in Malta, New York this morning. 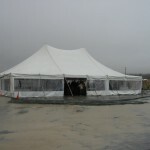 Globalfoundries had a nice tent set up with hot coffee, cookies, donuts, etc. It was a good thing because it was raining pretty hard and the gravel parking lot had a lot of water on it. Globalfoundries and M + W Zander had people on-site to answer questions about the project. They had a few large pictures of the construction site inside the tent as well as artist conceptions of the completed building. By the time I arrived they had run out of “fact sheets” but I was told to check their website and the information would be updated by Tuesday, October 27th. You can find their website at Globalfoundries.com. Hector Ruiz, the chairman of GlobalFoundries said that the new chip plant is “by far the most significant high-tech investment made in this country in decades.” This plant will produce the most advanced computer chips in the world when it is completed. I wrote a previous article about the chip plant in March. You can read it here: Globalfoundries Chip Plant in Saratoga County New York. 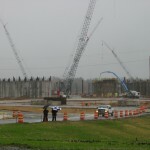 The construction and eventual operation of this plant will be an economic boost to Saratoga Springs and the surrounding area for years to come. What do you think about the plant? Leave a comment or send me an email. Thanks. 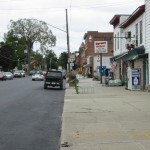 A section of Broad Street in Schuylerville. It’s about time. Broad Street in the village of Schuylerville, New York was finally given a new coat of blacktop this past week. Thousands of drivers who pass through here each day can now roll across a smooth, pothole free surface. Thank you New York State Department of Transportation. The road was resurfaced from the area of Champlain Canal Lock 5, about one mile north of the light where Route 29 turns south, all the way past Byron’s Market to where the Fish Creek goes under Route 4 just before the Schuyler House. The picture on the left shows the intersection of Routes 29, 4 and 32 in Schuylerville. 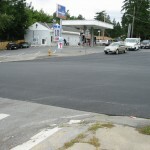 That is the Cumberland farms store in the picture. It is more commonly called “Cumbys” in upstate New York. I buy all of my gasoline at this station. Double-click on the picture to enlarge it. Route 29 is a major east west route in this area of New York. Thousands of drivers everyday use it to commute or travel from the Greenwich and Cambridge areas and parts of Vermont to the Adirondack Northway (Route 87), Saratoga Springs and the Wilton Mall area. Except for the Route 4 bridge just north of Schuylerville, which is an older, narrow, steel deck bridge that large trucks can’t use, you would have to travel 10 miles or so north to Fort Edward or 10 miles or so south to Stillwater to cross the Hudson River. Route 29 goes east for 12 miles after passing through Saratoga Springs and turns right when it hits Broad Street in Schuylerville. For a short stretch between the two traffic lights, Broad Street is Route 29, Route 4 and Route 32 at the same time. After a few hundred yards, Route 29 turns left and continues east across the Hudson River. Route 4 and 32 continue south for another two hundred yards or so. Looking north towards Byron's Market. After passing Byron’s Market and Burgoyne Road, Route 32 branches off to the right while Route 4 continues south. (If you stand on the sidewalk in front of Byron’s you can look up Burgoyne Road and see the Saratoga Battle Monument). This mile or so of road through Schuylerville was a total disaster and one of the worst roads in the area until the recent paving. It had been dug up and patched for years. Heavy trucks of all kinds turning, starting, and stopping at the two traffic lights while they traveled through the village, took its toll on the road. It was especially dangerous for motorcycles and bicycles. They had to watch out for old trolley tracks, loose bricks, and potholes. The new blacktop makes the entire village look better. I can’t wait for the Turning Point Parade to march down it on Sunday, August 1, 2010. 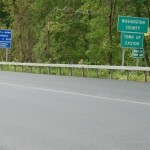 Route 29 at the Hudson River in Washington County. Route 29 is being repaved just across the river in the town of Easton, in Washington County, too. From the Hudson River bridge to the top of the hill just past where the old Some Place Else restaurant used to be, it is now all new blacktop. The slow vehicle lane is being extended also. The old lane was very short and narrow. Even if a truck or a farm tractor pulled over to let somebody pass, there wasn’t much time. The new lane will be wide enough for a truck or farm tractor to safely use it and long enough for cars to pass the slow moving vehicles. Here is a link to an article on Wired.com called, “McAdam Paves the Way.” He was born on September 21, (the day this post was written) in 1756 and did a lot to improve the roads of his day. 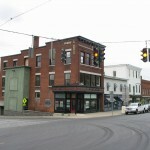 The main intersection in the village of Schuylerville. One of the two traffic lights in the village. Looking north at the Hudson River from the Route 29 bridge linking Saratoga and Washington Counties. I would like to hear what you think. General Electric is about to begin one of the largest environmental cleanups in the history of the United States. 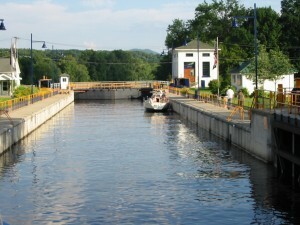 Beginning in May, GE is going to dredge the Hudson River in Fort Edward, New York to cleanup PCBs in the river bottom. 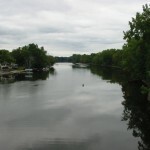 Eventually, 40 miles of the river will be dredged from Hudson Falls south to Troy, NY. I live in Washington County, New York, just across the river from Schuylerville. I am 13 miles south of where the dredging will begin. There are half a dozen “hot spots” where dredging will occur within a short distance of my house. They won’t be touched until Phase 2. 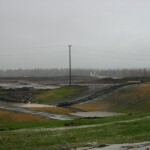 The area around Fort Edward will be dredged this year in Phase 1. There will then be a review process of what was completed. 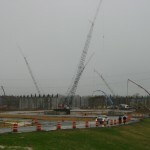 Phase 2 dredging should continue in the spring of 2010. It could take 5 years before all of the dredging is completed. It still amazes me that GE dumped the PCBs into the river in the first place. A lot of smart people work for GE. I read somewhere that the GE research center in Niskayuna, New York (near Schenectady), has more Phds. than anywhere else in the world. Someone at GE should have known that discharging this stuff into the Hudson River was a very bad idea, even in the 1940s. If not the 40s, than at least the 1960s. I don’t care if it was legal or illegal. I don’t care if they had a permit or they didn’t have a permit. It was stupid and irresponsible and they should have known better. Common sense should tell you that you shouldn’t dump this stuff into the river. Now they have to spend millions of dollars to clean it up. It would have been much smarter to either say that we shouldn’t manufacture this stuff in the first place because it is too dangerous or we have to figure out a safe way to dispose of it before we start making it. GE started dumping polychlorinated biphenyls (PCBs) into the Hudson River in the 1940s and continued to do so until 1977. I was trying to find out why GE eventually stopped dumping PCB’s in 1977 when I ran across this 2001 article by Charlie Cray called, Toxics on the Hudson: The Saga of GE, PCBs and the Hudson River. GE stopped discharging PCBs into the river because they were banned by federal law. The United States Congress banned the manufacture of PCB’s in 1976 when they passed the The Toxic Substances Control Act. PCBs are bad for you. They are the reason that you can’t eat fish from the Hudson. You can catch fish in the Hudson, but you must release them right away. The Environmental Protection Agency has an entire section of its website devoted to Hudson River PCBs. The Hudson River is beautiful in this area. It should be as clean as it looks. What do you think?